NEWS ANALYSIS: Norway’s biggest political drama in years has a high-powered cast of characters, but started last fall on the stage of a small theater company in Oslo. It climaxed just before the weekend, with Prime Minister Erna Solberg probably having to appoint her sixth justice minister in as many years. There were more developments during the weekend in what political commentators are calling both an “incredible” and “absurd” situation at the highest levels of the Norwegian government. Solberg herself said she was “shocked” when word came late last week that Justice Minister Tor Mikkel Wara’s domestic partner of 24 years, Laila Anita Bertheussen, had been arrested and charged with fabricating at least the latest of alleged threats against the justice minister and his family, including herself. Her defense attorney stressed during the weekend that Wara, who immediately went out on leave, was standing by her. They needed to find somewhere to stay, however, since their home was being ransacked by the police who otherwise have reported to Wara as justice minister. The people Wara’s ministry oversees were going through all their things, making it more difficult for him to resume his political role as their leader. Wara and Bertheussen were allowed to move home again on Saturday, after the ransacking was completed. Wara, meanwhile, is being supported by “good friends” who include two former top political advisers to both Solberg herself and Finance Minister Siv Jensen, leader of the anti-immigrant Progress Party. Newspaper Dagens Næringsliv (DN) reported that both Sigbjørn Aanes and Ole Berget, partners in the same high-power First House PR firm where Wara also worked before becoming justice minister last year, have taken holiday time in order to “help” Wara and Bertheussen. It wasn’t clear exactly how, but they were also the friends with whom Wara was out traveling last weekend (to see a Liverpool-Burnley football match in the UK) when his car was set on fire back home in Oslo. Police, their intelligence unit PST, top state prosecutor Tor-Aksel Busch and a local court in Oslo all believed evidence was strong enough to charge Bertheussen with reporting a crime when none existed, to make it look like someone was threatening her family. They think she set fire herself to a family car parked in their driveway. She and her own high-profile defense attorney, John Christian Elden, firmly deny that. What would have been Wara’s partner’s motivation? One thing is clear: what many Members of Parliament and party leaders are calling a “personal tragedy” for Wara and his partner began last November, when the small Black Box Theater in Oslo launched a nine-day run of a play called Ways of Seeing. 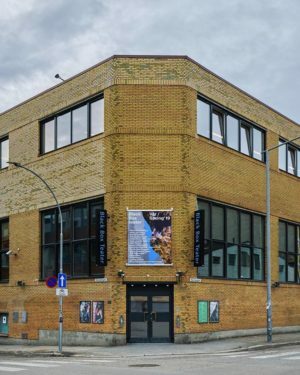 The play, so-called “documentary theater” in which actors play themselves, was about immigrants arriving in Norway and hoping to have escaped prejudice and racism, only to encounter it anyway. State broadcaster NRK reported how they search for a network of alleged racism, concentrating on the homes of some top politicians like Wara, NATO Secretary General Jens Stoltenberg and the leaders of a right-wing Norwegian website that’s critical of immigration. Bertheussen continued to complain in a highly public manner, not least on social media, about how the actors “secretly filmed my home while I was at home. They filmed our windows … and I was inside, me, who has never sought publicity.” She wrote that she feared the play would prompt attacks on the home she shares with Wara, by people who may get the impression they’re racists. A little over a week later, their home was indeed vandalized, with swastikas and misspelled versions of the Norwegian word for racist painted on both their house and car. It what was the first of five separate threatening incidents, the last of which was the car fire last weekend. Neither Wara nor Bertheussen are directly accused of racism in the play, but the script noted that Wara’s role as justice minister includes immigration and asylum policy, and that he took over for “the racist and Islamophobic Sylvi Listhaug” (who had to resign after accusing the Labour Party of being more concerned with terrorists’ rights than national security). Wara’s party has always kept restrictive immigration policy high on its agenda. Bertheussen was so upset by Black Box Theater’s play that she also filed a complaint to police against Black Box director Anne-Cecile Sibue-Birkeland and three other artists behind the play. Police initially dropped the case but later revived it, leading to charges also being filed last week against Sibue-Birkeland and the three other artists, for allegedly invading the privacy of those whose homes were exposed. Oslo Police stressed that its charges had nothing to do with those against Bertheussen. By the end of last week, both sides in the dispute faced charges, even as the theater claimed it had been exonerated by the charges against Bertheussen. Newspaper VG reported Sunday night, however, that the charges against the theater officials have now been dropped, for lack of evidence. The charges against Bertheussen were upheld. Her complaints over the past four months had won support among other Progress Party politicians but also criticism from those who claimed the theater group must be allowed freedom of artistic expression. Several top Progress Party politicians over the years “have had problems with freedom of expression,” wrote commentator Hege Ulstein in Dagsavisen over the weekend, noting that Progress politicians are known to challenge expression that they don’t like. After the fifth act of vandalism and arson against Wara’s home erupted last weekend, when he was away for the football weekend in the UK, he won bipartisan support from colleagues who bemoaned how difficult it’s become to be a politician in the public spotlight. They were joined by Prime Minister Solberg, who has later caught lots of criticism herself for criticizing the theater for making politicians’ lives harder, and exposing their families as well. When Bertheussen was charged late last week, Solberg was immediately asked to apologize to all those involved with the play, several of whom had been threatened themselves. When Solberg refused to do so, she was also blasted by other, more mainstream cultural and theatrical officials, including the head of the National Theater in Oslo. Was Bertheussen so angered by the play, and how she felt it could threaten her partner, that she planted threats herself to prove her point? Absolutely not, she claims through her lawyer. He told reporters over the weekend that she had answered investigators’ questions and now hopes they’ll find those guilty of vandalizing, setting fires and otherwise threatening her home. It remained unclear, meanwhile, whether Wara can ever return as justice minister. There’s nothing legally blocking that, according to a law professor at the University of Oslo, but the questions raised by the charges and the new power imbalance between the minister and his underlings loom large. His credibility as the nation’s justice minister has been damaged. Solberg won’t comment, claiming the police “must now be allowed to do their work.” That could take months, prompting others to claim that Solberg should finally take the justice minister’s position out of the Progress Party’s control in her coalition government and place it under her own Conservatives’ control instead. 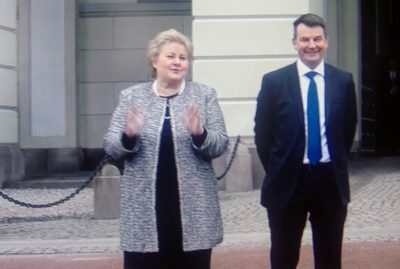 Progress’ justice ministers have repeatedly run into trouble, critics note, and Solberg needs stability within her cabinet in the run-up to the next national election in 2021.